Pour the cream and coconut milk in a saucepan on a medium heat. Do not let it boil but heat it for about 3-5 minutes. As the cream is heating, whisk the eggs and erythritol together. Remove the cream from the heat and gently pour into the egg mixture. Whisk until combined. Place the avocado in a processor and blitz until smooth. Pour this mixture back into the saucepan on a medium heat and whisk for 5 to 10 minutes until the mixture starts to thicken slightly. Add the vodka and stir (optional). Allow to cool or place in the fridge for faster cooling. Pour into the canister of an ice-cream maker and churn according to manufacturer’s directions. 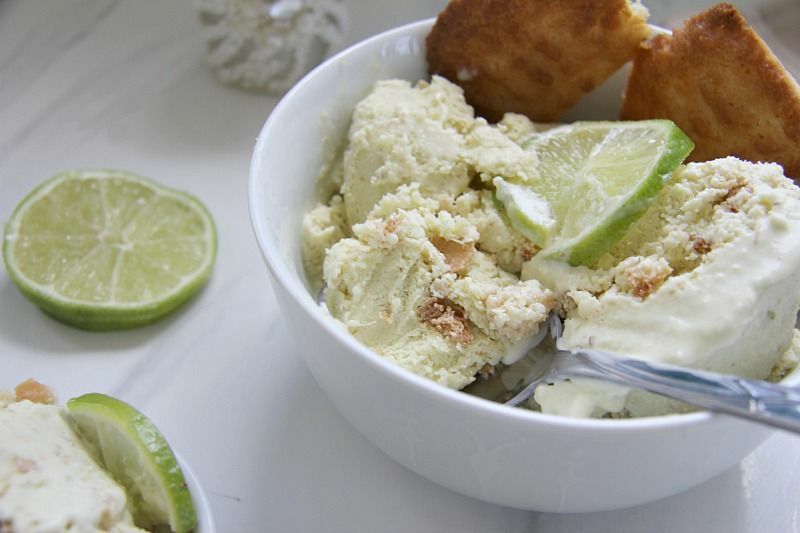 If you don’t have an ice cream maker, place in the freezer. Remove every 30 minutes to stir to distribute the ice crystals until frozen consistency is obtained. Can take about 4-5 hours. Whilst the ice cream is freezing, make the biscuit mixture. In a bowl, cream the butter and erythritol together with either a spoon or whisk. Add the vanilla extract and the egg. Beat until smooth. Add the almond flour, ginger and salt and mixture until you have a soft biscuit dough. Roll a walnut sized ball of the dough and place on the parchment paper. Press out into a circle. The cookies will spread when cooking so don’t place them too close together. 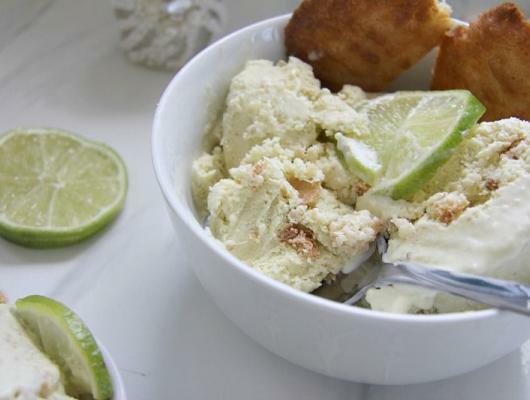 Key lime pie ice cream is a delicious combination of key lime pie and a low carb ice cream. It’s almost two desserts in one bowl.